Welcome book clubs and book club members. You will find questions relating to the individual books in The Tarot Mysteries on this page. If you have any questions or would like to arrange a Skype call with your book club and the author, Bevan Atkinson, please contact us at smcgowan@electraenterprisesofsf.com or call 415.390.6250. Book Club Discussion Questions about Bevan Atkinson’s The Fool Card. What was the author’s inspiration for this series? The tarot is considered, among many other things, a tool for training intuition. How did Xana’s intuition play a role in her willingness to re-engage with the world? How do the names “Hawk” and “Kinsey” tie this mystery series to other well-known mystery series? Why did the author choose to reference those names in particular? 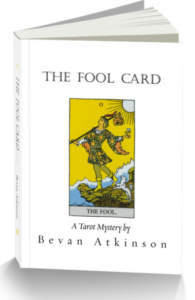 The first book in the series, “The Fool Card,” is a fast read and the story takes off like a rocket, with no subplot. The image of the Fool on the cover shows him about to walk off a cliff. How does that imagery relate to the way the story unfolds? How does Ms. Bard’s house at the western edge of the San Francisco peninsula, with its location in that city and its proximity to the Pacific Ocean, relate to the image of The Fool Card and Xana’s surprising willingness to take a leap back into life? The tarot deck, for some, has an unsavory reputation. Why do you think that is? What quote from the book stands out to you? Why?